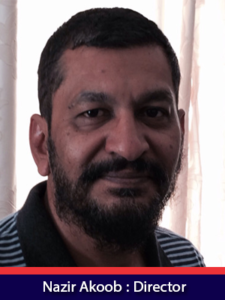 Nazir Akoob qualified with a Bachelor of Science degree in Quantity Surveying from the University of Natal in Durban in 1990 and worked as a Quantity Surveyor in Durban. He subsequently joined ABSA Bank and initiated the establishment and growth of the Commercial Property Finance Division in KwaZulu Natal for ABSA. From a non-existent division, ABSA Commercial Property Finance in KwaZulu Natal shot to number one within a period of 18 months. He later transferred to Cape Town where he was involved in assisting with the national operations of the Real Estate Asset Management division (REAM) at ABSA in Cape Town. He then entered into independent business ventures and later joined PetroSA in 2008 on a fixed term contract. He was appointed as Senior Contracts Administrator and was involved in the early stages of Project Mthombo, a proposed refinery project in Coega in the Eastern Cape of South Africa. He was also involved in the procurement and logistics of the offshore drilling campaign in Equatorial Guinea and finally Project Ikhwezi at which point his contract was coming to an end. He has displayed qualities in leadership, planning, organisation, decision-making and team building. He is skilled in visualising, strategizing and implementing resourceful and enterprising solutions to problems. He is a team player with exceptional communication, interpersonal and customer service skills. He has established a powerful and valuable network of people across a broad sphere of industries and organisations across the world.